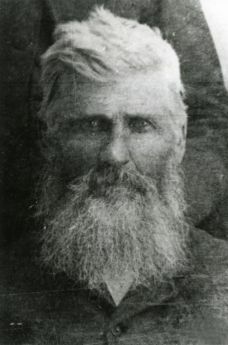 Joel William White: was a DANITE, MORMON SHOOTER AND CLUBBER, was 1st lieutenant in a platoon in Company D when, in the summer of 1857, he was promoted to captain of the company. He was born in 1831 the town of Erie, Erie County, Pennsylvania on the southern shore of Lake Erie. He also was a farmer and machinist. "Some time in the fall of 1857, not long after the Mountain Meadows massacre, it was decided by the authorities at Salt Lake City that Lieut. Tobin must be killed. Tobin had left a train in Salt Lake, joined the Church there, and afterwards married a daughter of Brother Charles C. Rich, one of the twelve apostles. Tobin was a smart man, and soon after his marriage he was sent to England on a mission. White and Willis overtook the company that Tobin was traveling with at a point near the crossing of the Magottsey. They found where he was sleeping, and, going to him as he lay on the ground rolled up in his blanket, they shot him several times. Although thinking him dead, they concluded to shoot him once more to make certain that he would not escape, so they put a pistol against his eye and fired; the ball put out his eye, but did not kill him. The Angels made their escape and returned to Salt Lake City, and reported that their orders were obeyed. Severely wounded as he was, Tobin recovered, and was, when I last heard from him, in the Union army."